The Waterfall, located within the resort-like Shangri-La Hotel, Singapore, is one of my favourite Italian restaurants in Singapore. Chef de Cuisine Marco De Vincentis has just unveiled a refreshed menu of Southern Italian classics with 27 new a la carte creations and six new desserts. You should also take advantage of the promotion right now which gives you double Golden Circle points when you dine on weekdays (equivalent to 20% cash back!). Personally, there are two things that The Waterfall does (and continue to do) very well - the refreshing salads and the seafood dishes. The introduction of the Canestrato Pugliese e Pomelo is a testament to this - this refreshing mesclun salad is tossed with black olives, canestrato cheese, white balsamic dressing with fresh pomelo wedges for that citrusy tang which adds dimensions to the dish. The second salad that I tried was the Manzo Black Angus Marinato which is basically a rocket salad that is served with pecorino cheese and this amazing marinated Black Angus beef before drizzling with pine nuts. Even though I generally do not enjoy arugula leaves, I actually finished most of this off my plate. I really love that delicious beef and that zesty dressing that contrasted with the peppery taste of the rocket salad. 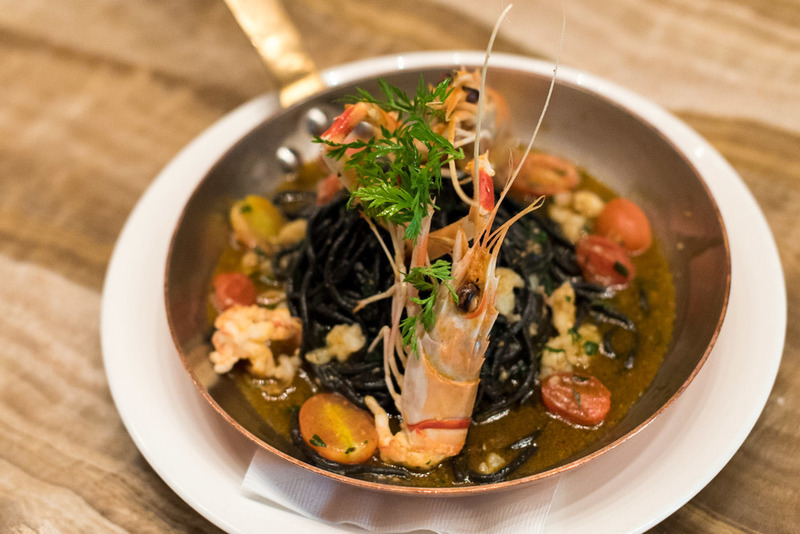 If I truly had to select a winning dish out of the five that I have sampled recently, the Spaghetti Al Nero Di Seppia, Scampi E Datterini is the clear winner! Cooked in the most delicious and rich scampi sauce, fresh cherry tomatoes and a hint of chili for that slight kick, this homemade squid ink pasta had everything I wanted in a dish. Firstly, the presentation was just stunning - simple but visually appealing. Secondly, I love the fresh seafood flavours in this dish. The squid ink pasta is cooked perfectly and the scampi was naturally sweet (perhaps a little lemon zest would have brought out the flavours a little more but this is just a personal preference). If you prefer a non-pasta dish, you definitely have to try Chef Marco's Dentice Rosa Al Forno, Con Scampo, Patate Olive E Ciliegini. This signature baked pink snapper is served with roasted scampi, creamy mashed potato and beetroot, black olives as well as cherry tomatoes. The pink snapper is cooked to a perfect doneness and the flesh was firm yet moist, making it an ideal dish for all fish-lovers. For dessert, we had the most beautiful Semifreddo Al Torrone E Uvetta - a unique homemade nougat parfait with salted caramel sauce and raisins. As you may already know, I am not a dessert person but the nougat parfait component was definitely an interesting one! I really like the refreshed menu at The Waterfall and thankfully they did not remove my all-time favourite - the super delicious seafood stew, Stufato di Pesce.